Our practical hands on program gives you the skills and knowledge to prevent and treat disorders of the foot and ankle. Learn assessment and management skills used in podiatric practice and how to treat patients with complex medical conditions. Know how to work in different areas of podiatry such as paediatrics, surgery and sport injuries. 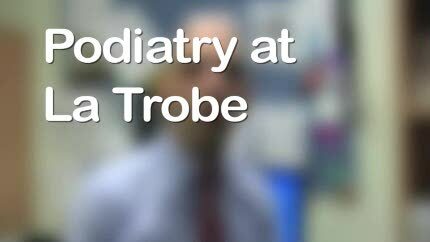 Podiatrists work in a variety of settings, including public and private practice, community health centres, hospitals and academia. They work with people of all ages in a wide range of clinical settings, such as paediatrics, surgery and sports. La Trobe designs its courses with your future career in mind and partners with a range of professional organisations for accreditation and registration. Refer to the detail for each course below to see what professional registration and membership options exist. Graduates may be eligible to work overseas in countries like the United Kingdom, Singapore, Canada and New Zealand, subject to each country's registration requirements. If you have completed common first-year subjects in another degree at La Trobe, you may be eligible to transfer into the second year of the Bachelor of Health Sciences/Master of Podiatric Practice degree. 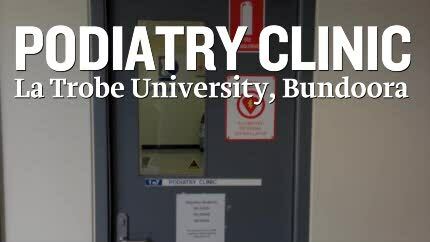 We have our own podiatry clinic at the Melbourne campus where you will be directly involved in the treatment of patients. Further clinical experience is gained through external placement in hospitals, health centres and private practice under the supervision of a clinician. Placements are available in metropolitan Melbourne, rural and regional Victoria, interstate and overseas. You must do placements in Melbourne and in rural or regional Victoria. We also offer opportunities for some overseas clinical placements. I think this course gives us excellent career opportunities.